California Girl and I spent a long weekend in Chicagoland for a friend’s fiftieth birthday. 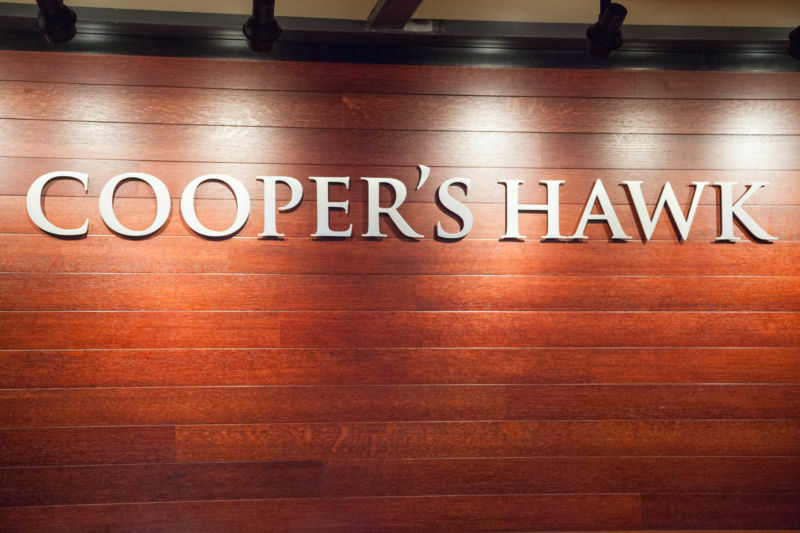 We were taken for dinner to Cooper’s Hawk Winery and Restaurant in Arlington, Illinois. Cooper’s Hawk make wine in Illinois from grapes that they select from West Coast vineyards, since Illinois lacks a climate for growing grapes. Cooper’s Hawk also makes wine from fruits other than grape. California Girl and I felt that the readership of this blog would expect us to undertake a tasting of the wines and we would not wish to disappoint our audience. California Girl comments: I think that The Brit means to say that he would not pass up the opportunity to do a wine tasting. The tasting room was large, but packed. The servers had time to do no more than pour our taste and move onto the next set of customers. There were menus on the table that described the wines in detail, complete with tasting notes, which went someway to making up for the lack of information from the servers. When we did ask questions of the staff, they did not show the same level of expertise and passion that makes visits to so many wine country tasting rooms an informative and pleasurable experience. Also there were no buckets on the bar to tip-out wines when we did not wish to drink the whole pour. The staff were happy to empty the glasses into the sink before pouring the next taste, so this deficiency was not critical. One more thing that differentiated this tasting from those in Napa was the cost of the tasting; it was just $7. None of the wines were of a specified vintage, nor any origination more precise than America provided. We started with a Prosecco that sold for $19.99 a bottle. The wine was served too cold for it to have much of a nose. The drink was sweeter than I like, probably at the level of a demi-sec. The taste was a mix of citrus and peach and the fizz was pleasingly light. I admit that most of the sparkling wine that I drink is made by the Champagne method and it is a while since I have tasted a Prosecco, so I do not have a good reference for this wine, but I was somewhat underwhelmed. California Girl comments: The wine did have peaches and citrus on the palate, but it also had a fair bit of yeast in the flavor which I felt overwhelmed the sip. California Girl comments: This one only got two sips from me. It just wasn’t pleasing enough for a third. The last white we tried was the unoaked Chardonnay ($18). The wine was pale in colour. Despite, once more, being over-chilled I did get a faint nose of peach, apple, and honey. In the mouth there was a medium acidity, pepper, and apple. It was on the sweeter side for a Chardonnay. It was my favourite from the three white wines, but there is better unoaked Chardonnay at this price point. Our first red was a $23.00 Barbera. This wine had a light-purple hue. The nose was a mix of plum and malt vinegar. This latter component did not bode well for the taste, but whilst there was high acidity, it was balanced with rich mixed berries, and subtle tannins. I know that our friends did not agree, but I liked this wine. California Girl comments: I thought this wine was drinkable, but nothing to write home about. The next wine we tried was the Shiraz, which sells for $19. The nose was of a musty forest floor, with distinct odors of raspberry. In the mouth there was plum and soft tannins, that gave way to leave pepper and cinnamon as the aftertaste. The group liked this enough that we ordered a bottle for our table. California Girl Comments: I thought this was the best of the lineup. It had surprisingly good flavor and had a smoothness I liked. It isn’t often seen in Shiraz so that was great. The third red was the Cabernet Sauvignon Lux which sells for $36. The nose of plum and blackberry was very light, nothing like as rich as I want from a Cabernet. In the mouth the understated tannins mixed with plum, raspberry, vanilla, and tobacco. However, all of these interesting elements were offset by a sweetness that felt out of place; I do not know if this was residual sugar or added after fermentation. We took a step back in intensity with our next wine; The Pinot Noir Lux ($40). This offered a nose of rhubarb, plum, and wet earth. The acidity was surprisingly low for a Pinot and was well complemented with rich flavours of plum, pepper, and smoke. Without doubt this was my favourite of the red wines that I tried. California Girl comments: I am really glad we like this bottle as we have one in our cellar that was given to us as a gift. I am looking forward to cracking it open. I finished with the Cabernet Zinfandel ($23), a blend of Cabernet Sauvignon and Zinfandel. The nose was disappointingly muted, but did offer a mix of plum and pepper. The wine like the Cab seemed to be overly sweet, which unbalanced what otherwise would have been an interesting blend of plum and raspberry with hints of spice. California Girl comments: One of the things that I thought was really cool about Coopers Hawk is that they decant their wines in suspended glass aerators before serving your bottle. 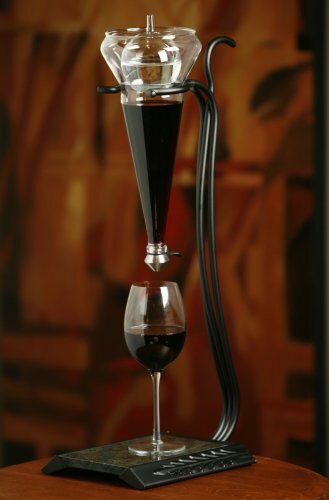 It not only looked cool, but it helped the wine achieve its best flavor. In summary, the wines we tried at Copper’s Hawk were underwhelming, but it was only the Sauvignon Blanc that I actively disliked. Of the wines that we tried that night, the Pinot was the one I would wish to try again. The caveat about that night is because the next night our host opened a bottle of Cooper’s Hawk GSM, which I enjoyed. California Girl comments: Our friends who are members there stressed to us that the blends they make is where they really shine. After tasting a bottle of the GSM, I would have to agree. We have written a separate post about the dining experience at Cooper’s Hawk, but one of the advantages of having a tasting room is that it enables you to select a wine that you wish to have with the meal.